Toyohara Kunichika (1835-1900) The Actor Onoe Kikugoro V (Onoe Baiko) as Shibata Katsuie, from the series One Hundred Roles of Baiko, 1893. Deluxe Oban. This powerful design is from Kunichika’s series The 100 Roles of Baiko. Kunichika and Baiko were friends. This ambitious series, printed on fine paper and using extensive blind embossing and mica powder was commissioned by Fukuda Kumajiro in 1893. The bulk of each print portrays the actor Onoe Kikugoro V, the upper register shows a different actor in the supporting role. 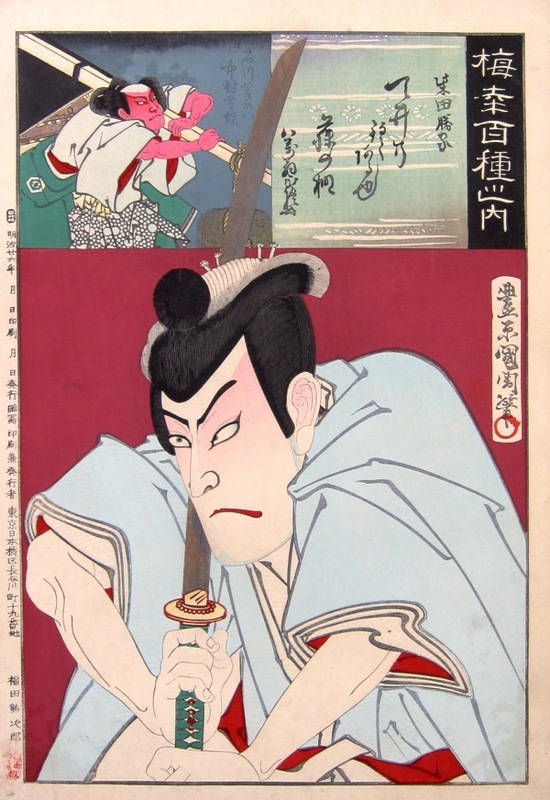 In this print, Kunichika shows Baiko as the great sixteenth century warlord and samurai Shibata Katsuie (1522 - 1583) in a striking pose wielding a sword. The actor Nakamura Shikan as Ishikawa Hachizaemon is pictured in the cartouche. Katsuie was a real character from history, well known in Japan as one of the retainers of the warlord Oda Nobunaga and opponent of Toyotomi Hideyoshi whose army defeated him at Kitanosho castle in 1583. 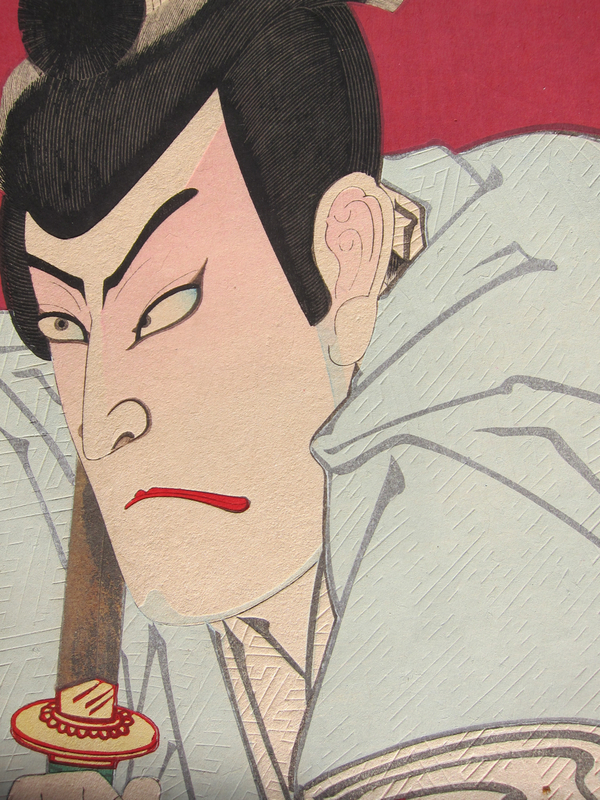 In theatre, his final days at the castle and the sacrifice of his wife, his seppuku and the fate of his daughters have led to numerous plays and subsequent woodblock prints. This series is one of Kunichika’s best portrait series. This print is in exceptionally fine condition. Very clean, unfaded and with little surface damage. The colour and impression are perfect and the the print has many delicate refinements - the mica in the upper cartouche, the deep embossing on the robes of Katsuie, the lacquer highlights on the blood on the sword. The dramatic pose and the great sword that cuts the print in half emphasise what a great achievement this was for Kunichika and what an outstanding moment these prints represented for late nineteenth century Japanese art.